Some weeks ago I was invited to a Christmas Turkey Masterclass with Marco Pierre White. It was hosted at his beautiful restaurant, Marco, in the grounds of Chelsea Football Club. I was one of a few lucky bloggers who went behind the scenes into Marco's actual kitchen to watch the man himself demonstrate how to prepare, cook and carve the perfect Christmas turkey. The best part was that we got to eat it as well. Marco met us in the restaurant area to give us a little run down of the day. Despite how scary he seems on TV, he was quite friendly and not that intimidating at all. He's an excellent chef, and not fancy for the sake of being fancy. Marco insisted that making Christmas dinner should be as fuss-free and relaxed as possible. 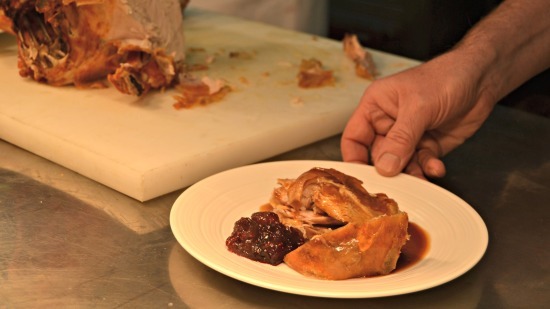 He showed us how easy it can be to make a really cracking turkey, beautiful gravy and cranberry sauce. He also gave us lots of great tips and advice. Marco doesn't roast a whole turkey - instead he cuts it into sections and roasts only the crown and the thigh joints. This is much easier, quicker and makes the meat more juicy. Nothing is wasted, as he uses the legs, wings and carcass to make a really good turkey gravy. He also recommends using a 10-12 lbs turkey as this is a good size for a domestic oven. A meat probe is the easiest and safest way to determine when the turkey is cooked. They are great for avoiding over-cooked, dry turkey meat. When it comes to side dishes, Marco suggested to do whatever you find easy and whatever people like to eat. Some ideas are sweed purée, braised red cabbage, roast parsnips, frozen sprouts roasted in butter and even good old frozen peas! If you've never cooked a turkey before, or never cooked one successfully before, I really recommend you try this method of preparing, stuffing, cooking and carving your bird. The preparation takes a little time but it's simple and will give you a delicious, perfectly cooked juicy turkey. All the instructions are below including the recipe for the beautiful turkey gravy that Marco made for us. 1. Place the whole turkey on a chopping board and set aside the giblets and neck for the gravy. Remove the wings. Pull them out to the side so the skin is taut, and cut as close to the crown as possible. 2. Remove the legs. Hold the leg at the joint, pull it out to the side so the skin is taut, and use a sharp knife to remove the entire leg as close to the crown as possible. 3. Remove the turkey carcass. Turn the turkey so it is vertical, grip the top tightly and slice down the right and left of the back bone. Prise the back down so that it is flat and using the knife, cut across the top of the back to remove it completely. You will just be left with the turkey crown, which is the breast meat on the bone. 4. Separate the thigh joint from the leg. Grip the bottom of the leg and cut just above the joint. Use the thighs for roasting and place the legs with the wings etc to use for the gravy. 5. You will be left with the crown and the thighs ready for roasting. Using a really sharp knife, chop the wings, legs and carcass ready to use to make a really good turkey gravy. 1. Marco used a 50 / 50 mixture of packet stuffing and sausage meat mixed with some finely chopped sauteed onions to stuff his turkey. He recommended reducing the water content of the stuffing by a third for the stuffing inside the bird. 2. To stuff the crown, pull back the skin slightly and insert the stuffing into the neck end only. Pull the skin back over the meat to seal it in place. 3. To stuff the thigh joints, peel back the skin, insert the stuffing underneath and pull the skin back over to seal. 1. Pre-heat the oven to 180 C/160 fan/gas mark 4. Bring the turkey to room temperature before it goes into the oven. 2. Place the chopped up bony turkey bits at the bottom of two roasting trays, along with a couple of chopped onions, a chopped garlic bulb, a knob of butter and a splash of water. This will allow the juices to collect in the tin for the phenomenal turkey gravy later on. 3. Brush the crown and thigh joints all over with butter or sunflower oil and season with salt. 4. Place the crown in one of the trays on top of the chopped bones and put in the oven on the top shelf. Place the two thigh joints into the second roasting tray on top of the bones and place on the bottom shelf. 5. Marco recommends for a 10lb turkey (prepared as above) roast the crown for approximately 1 hr 30 minutes and thighs for approximately 55 minutes. However, every oven is different, this is just a rough guideline. 6. Test to check the meat is cooked using a meat probe inserted into the thickest part of the meat. When the breast reaches 66C and the thigh 72C the turkey is cooked to perfection. If you don’t have a meat probe, insert a clean skewer into the thickest part. If the juices run clear, the turkey is cooked. If pinkish, return to the oven for a little longer then re-test. 1. Let the turkey rest before carving. Make sure you have a sharp good quality carving knife and be confident. 2. To carve the crown, first take out the stuffing by carefully holding it with your finger tips and gently cutting around it, then slowly removing it from the bird. 3. 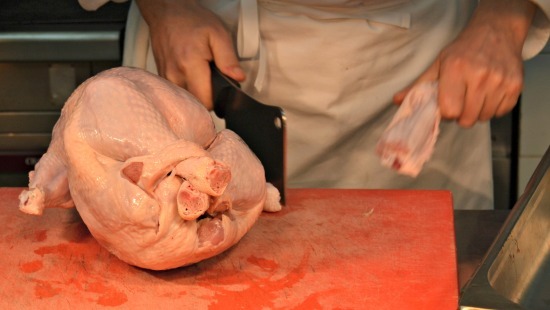 Slice the turkey breast by cutting downwards and moving the knife lengthways in long, smooth diagonal strokes. Avoid pulling the slices back and forth as this will cause the meat to break. 4. After carving one side, turn the crown around and start to carve the other side using the same technique. 5. Before carving the thighs, remove the skin and the stuffing from the joints by slicing around the stuffing and gently removing it. 6. To carve the thigh meat, hold the joint at the bone and run the knife down either side to remove it. Use your fingertips to gently hold the meat and carve lengthways. 7. 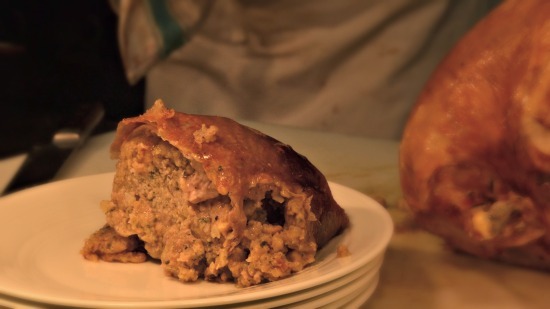 Once you have carved all the meat, carve the stuffing into thin slices to serve with the turkey. 1. Place the chopped up bony turkey bits at the bottom of two roasting trays, along with a couple of chopped onions, a chopped garlic bulb, a knob of butter and a splash of water. Roast in the oven along with the turkey (see above preparing and cooking the turkey). 2. Put the tray on the hob and top up with boiling water. Add some turkey paste or bouillon and give it a really good mix. Allow to simmer and scrap the bottom of the dish to remove all the brown sticky bits stuck to the bottom of the tray which have all the lovely flavour. Spoon away any fat from the surface. 3. Pour the turkey gravy through a fine mesh sieve into a saucepan. Use a ladle to push everything through the sieve as much as possible to give the best flavour. 4. Bring the gravy to a gentle simmer in the saucepan. Dissolve 2 tablespoons of cornflour in around 150 ml of water. Gradually add the cornflour mixture, simmering and stirring all the time, until the gravy has reached your desired thickness. The gravy should be thick enough to stick to the meat, but not overly thick. Keep warm until you're ready to use. For more on cooking the perfect Christmas Turkey, including videos recipes from Marco and ideas for your leftovers visit Lean on Turkey. This post is in association with Lean on Turkey. All words and photographs are my own.